One of the most complex and important of all human organs is the brain. So it is not so difficult to imagine that the brain is the one organ that is most in need of protection from various substances, some that we deliberately ingest such as drugs. Scientists would like to see how various substances as well as toxins and diseases affect the brain and its functioning and to do this they have created an organ on chips. To study the effects of drug abuse, for example on the brain, scientists need to look at the interaction between the blood vessels, the Blood Brain Barrier or BBB for short and brain cells. This has been a problem. In vivo such as the human brain tissue has been too complex of a subject to study while In vitro models such as cells in a dish are way too simple. 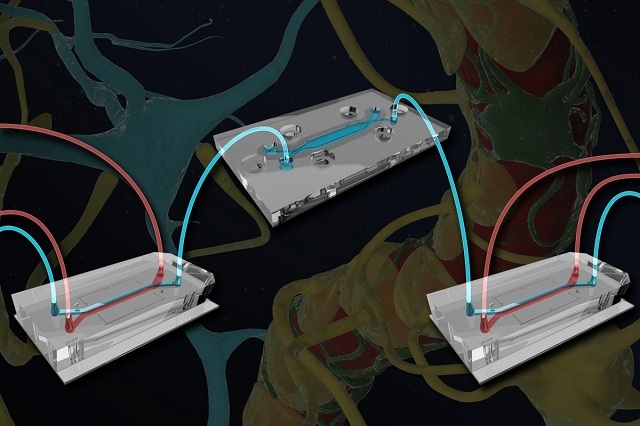 To overcome this challenge, scientists have made an organ on chips that mimic actual brain functioning when it comes to drug abuse. This new method of an organ on chips is “just right” without it being too simple or too complex. One organ on multiple chips? The brain is a very complex organ and to study scientists have used multiple chips instead of just one. Organ on chips is used in neurological studies and now has found a place in showing scientists the workings of the brain. BBB is made up of blood vessels and pericyte and astrocyte cells. The blood vessels transport oxygen and nutrients to the brain. The blood vessels are very careful about what gets transported to the brain. They do not allow some molecules to get into the brain. But when a person ingests drugs on a regular basis, these molecules find a place in the blood stream to the brain and then damages it. The brain’s sensitive neurons take a beating in this case. Another function of the BBB is to help the brain in regulating its functioning. To discover the effects of drugs on the brain, scientists have used an organ on chips. What this is basically is three distinct chips that are connected using microfluidic channels. These three chips represent the three functions in the brain which are the supply blood, the neuronal compartment and the draining blood vessels. The micro fluidic channels transport the chemicals and other substances between the chips in the organ on the chips setup. This organ on chips is connected in such a way so as to create a fully linked system all on its own. When scientist suffused the blood stream with drugs in the organ on the chips setup, the molecules that were not initially allowed into the blood vessels entered it and this resulted in damage to the neurons in the brain. The organ on chips setup has confirmed what scientists initially believed that brain damage could result from unwanted molecules entering the blood stream and damaging the neurons in the brain.